After this season of sickness, we were left with quite the assortment of different kinds of OTC and prescription medications. Especially since we had to try a few things in different flavors because our son is very sensitive to tastes. 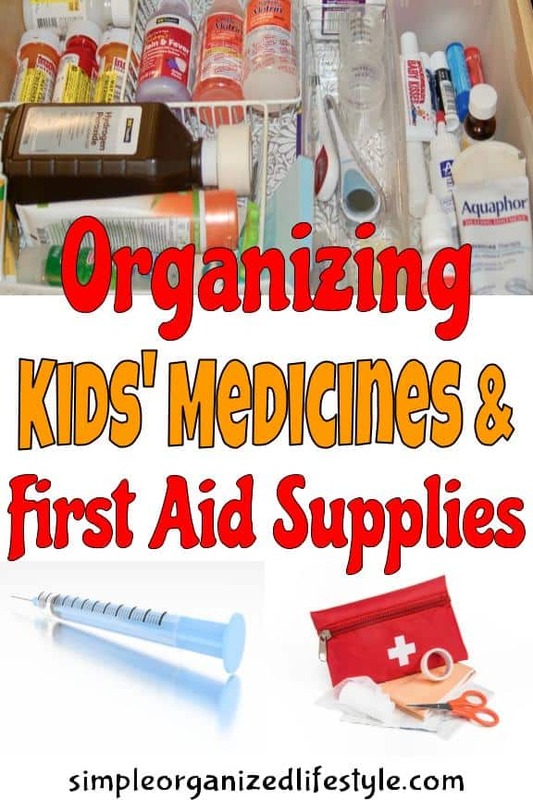 It was past time for organizing kids’ medicines and first aid supplies. I hope we don’t have to open this kids’ medicine drawer all summer! However, summer comes with the need for different first aid supplies and it’s good to know everything is in one place. I’m sharing our way of organizing kids’ medicines and first aid supplies in hopes that you don’t have to use them either, but you have a go-to spot just in case! 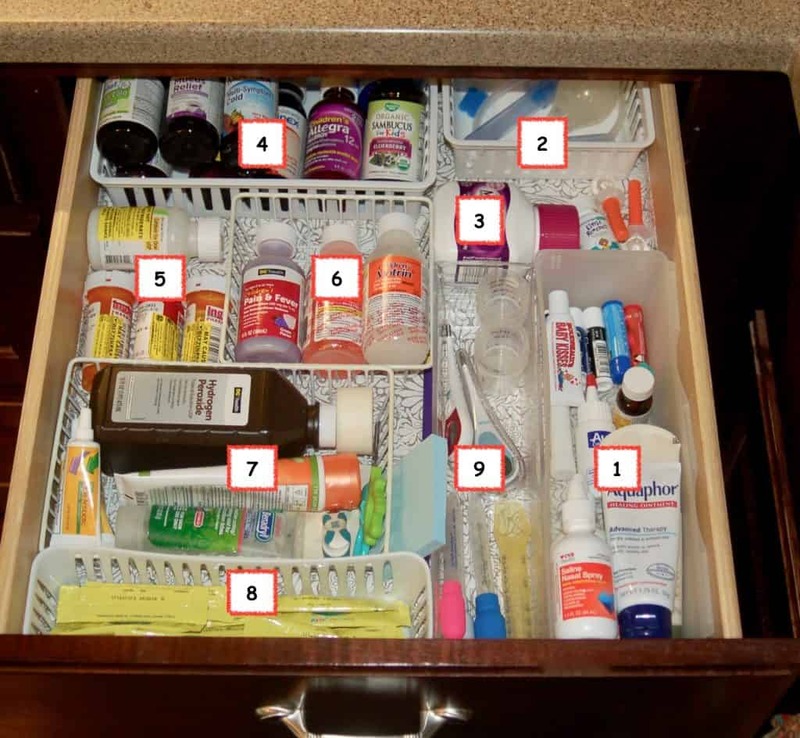 Our medicine drawer is organized into sections with small plastic bins. There is a printed drawer liner under the bins that helps in case of spills. We also have a sticky note and pencil in the drawer for keeping up with times any medicine(s) is given. Before I sorted the medicine into bins, I tossed out anything expired. Next I put medicines together by how they are used. In this bin, we keep supplies for chapped lips and skin (aquaphor can handle any of those issues!). We also keep eye drops, saline spray and Auro-Dri for swimmer’s ear. When our son has cough and cold symptoms without fever we usually give him some OTC medicines for relief from a stuffy nose or bad cough. It is so hard to see and hear them frustrated from a stuffy nose or cough. We’ve had some good luck with small doses of Robitussin and Mucinex from time to time to help through the night. It’s also where we keep allegra for seasonal allergies (pollen is awful where we live) and Sambucol Elderberry for kids. My mom bought the Sambucol for kids when we just couldn’t seem to build our son’s immune system back up. I didn’t know much about it so I read the reviews and took it myself and it really seems to help. In fact, we all take it when there’s a lot of sickness going around. Although fingers crossed we don’t have to use any of it, we have a few prescription medications for things like nausea that do not have to be refrigerated kept in the medicine drawer. The recent two rounds of strep throat were so miserable with the high fever that came with it. Our pediatrician recommended the every three hour rotation with motrin and tylenol so that’s why we have both on hand right now. We also kept giving him popsicles and stepped outside a few times. A high fever can be so scary! Scrapes and scratches are inevitable from time to time. We have a section in the medicine drawer with basic first aid supplies. These are things like peroxide, neosporin, bandages, clippers and benadryl gel for insect bites or stings. I like keeping first aid supplies in a plastic container so I can just grab the whole thing and take it wherever I need to. Taking medicine as we’ve had to for strep and flu has been really hard on our son’s gut health. Adding a probiotic each day has greatly helped. We have a section for the thermometer and medicine droppers. I’m so thankful that taking a temperature is as easy and quick as 8 seconds under the armpit. I remember growing up and holding that glass thermometer under my tongue for what seemed like forever! This drawer works because it’s out of reach from our son but still quickly accessible if we need it. It helps to have everything in one place so that gathering a few essentials for travel is easy. It provides us with a way to organize kids’ medicines and first aid supplies with storage that is safe and efficient.